Purpose: Culturally competent health care providers understand cultural attitudes, values, beliefs and practices and are able to use this knowledge to guide patient care. Rising oral health disparities among racial and ethnic minorities require that dental educators emphasize the attainment of cultural competence in order to prepare students to effectively care for patients with backgrounds different from their own. This study investigated the role of community rotations on the cultural competence of second-year Texas dental hygiene students. Results: Students scored highest in attitude (86th percentile). Time spent in community rotations (p=0.009), number of community rotations (p=0.028), racial/ethnic diversity of program clinic patients (p=0.042), and training hours (p=0.044) were associated with increased cultural competence scores. Students with over 50 community rotation hours (p=0.006) scored significantly higher than students with less than 50 hours. Generally, those with four rotations (p=0.002) scored highest. Those with public clinic (p=0.049) and school (p=0.044) rotations scored significantly higher than those without these experiences. Those with nursing home (p=0.009) and hospital (p=0.026) experience scored lower than those without these experiences. Students seeing the most racially/ethnically diverse patients in program clinics scored higher (p=0.014) than students seeing less diverse patients. Those with 6-10 training hours scored higher (p=0.013) than those with other training levels. Hispanics scored significantly higher than whites in skill and overall cultural competence (p≤ 0.005). Conclusion: Dental hygiene programs should invest time in cultural competence training and choose a robust program of community rotations, while considering the diversity of the student body and clinic patient pool to enhance graduates' cultural competence. The participants in this study were second-year dental hygiene students from the twenty-six dental hygiene programs in Texas. First-year students were excluded, because they do not usually participate in community rotations. The programs and their contact information were identified from the Texas State Board of Dental Examiner's website. Fourteen of the twenty-six programs responded, but only twelve programs actually participated. This sample size of 239 represented almost half of the dental hygiene programs in Texas with a full range of community experiences and patient diversity. The Texas Dental Hygiene Program Inventory (TDHPI) was emailed to program directors to identify the number of hours students spent in different types of community rotations, number of hours of CC training, and the race/ethnic proportions of students and patients. Twelve directors completed the TDHPI and returned a signed site authorization letter, granting permission for their program to participate in the study. Approval was granted by the Texas A&M College of Dentistry Institutional Review Board (#2015-0555-BCD-EXM) and each individual program's Institutional Review Board, where required. Each responding program was then mailed a packet that contained the Clinical Cultural Competency Questionnaire Modified (CCCQM) for each second-year dental hygiene student with a self-addressed envelope for survey returns by the program directors. The program directors distributed the surveys to the second-year students (n=239) during their last semester of the program. To ensure survey compliance, five contacts were made with the directors: (1) emailing of TDHPI, (2) emailing of survey invitation and site authorization, (3) mailing of cover letters and CCCQM packets, (4) reminder emails to directors and (5) thank you emails after receipt of surveys. The anonymous questionnaire contained twenty-three questions adapted from the CCCQ that measured their self-assessment of CC in regards to knowledge, skill, comfort, and attitude, yielding an overall CC score and also two demographic and two open ended questions. This survey was used with permission from Robert C. Like, who developed the original CCCQ at the Center for Healthy Families and Cultural Diversity, Department of Family Medicine, Rutgers Robert Wood Johnson Medical School.26 The instrument uses a 5-point Likert-scale that allows dental hygiene students to self-assess their knowledge, skill, comfort, and attitude regarding culturally competent patient care. The survey was modified for ease of completion and to better answer the research questions of this project. The CCCQM was reviewed by a committee of experts in study design, data analysis, and cultural diversity at Texas A&M College of Dentistry. Prior studies established a high level of reliability and validity for the original CCCQ.23-25 In this study, Cronbach's alpha showed that the CCCQM was highly reliable overall (α=0.908) as well as each of the four scales of knowledge (α=0.844), skill (α=0.863), comfort (α=0.856), and attitude (α=0.708). Data analysis was performed using IBM SPSS Statistics, Version 22 software. The basic findings of the CCCQM, including demographics, were summarized by descriptive statistics. Hypotheses about differences among and between groups were tested using the Kruskal-Wallis test and pairwise Mann-Whitney U tests respectively. Kendall's tau correlation was used to test associations. These non-parametric procedures were more appropriate since the data were non-normally distributed, and there were numerous ties in the data. A significance level of less than 0.05 was used. Specifically, these statistical tests were used to look for the relationship between various factors and the knowledge, skill, comfort, attitude, and overall CC score of Texas dental hygiene students. The four scales were also combined to yield an overall CC score. All 239 CCCQM surveys were returned yielding a 100% response rate. 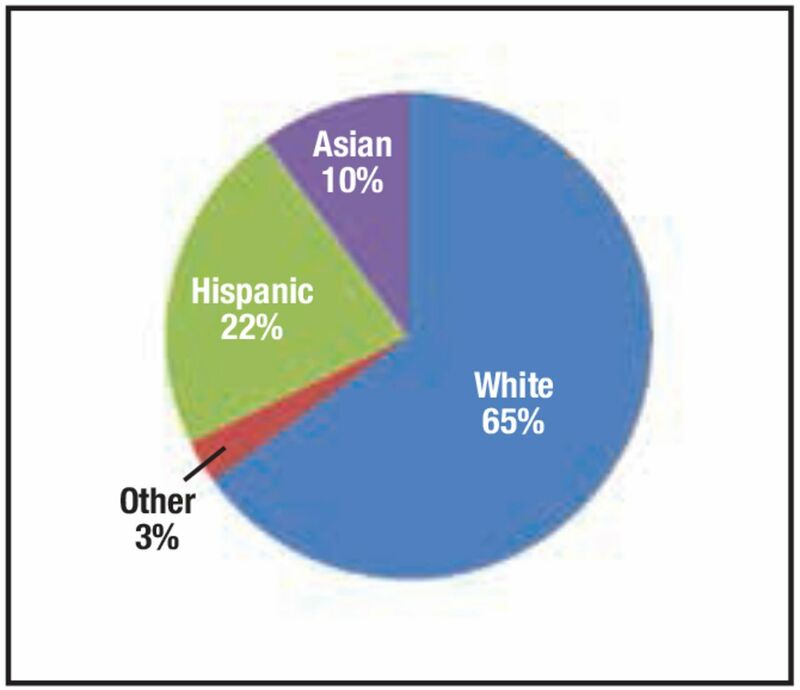 The race/ethnicities of student respondents, as reported by program directors, are displayed in Figure 1a. 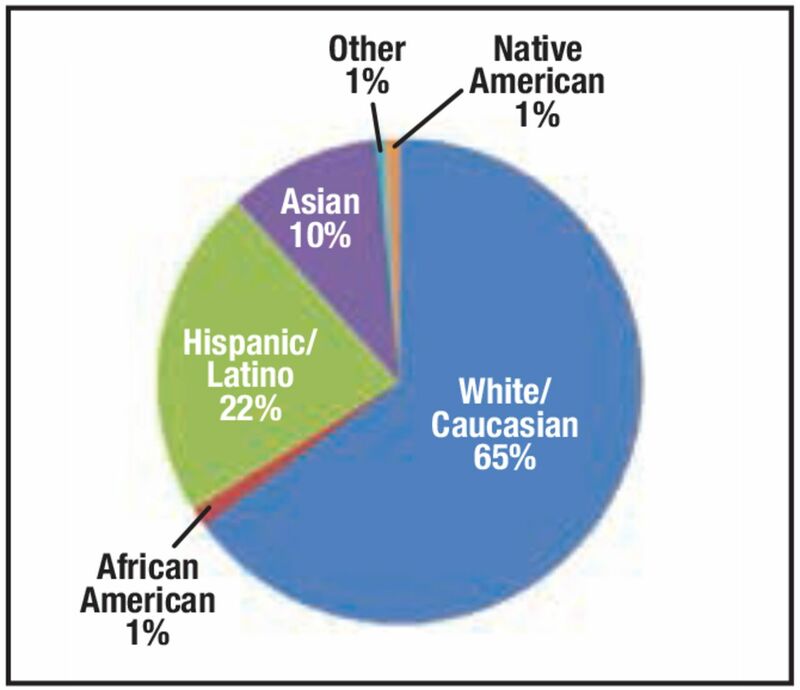 The majority of students were white/Caucasian (65%), followed by Hispanic/Latino (22%), Asian (10%), African American (1%), Native American (1%), and “other” (1%). Due to sparsity in some of the original six groups, students were collapsed into four categories: white, Hispanic, Asian, and “other” which included the remainder (Figure 1b). 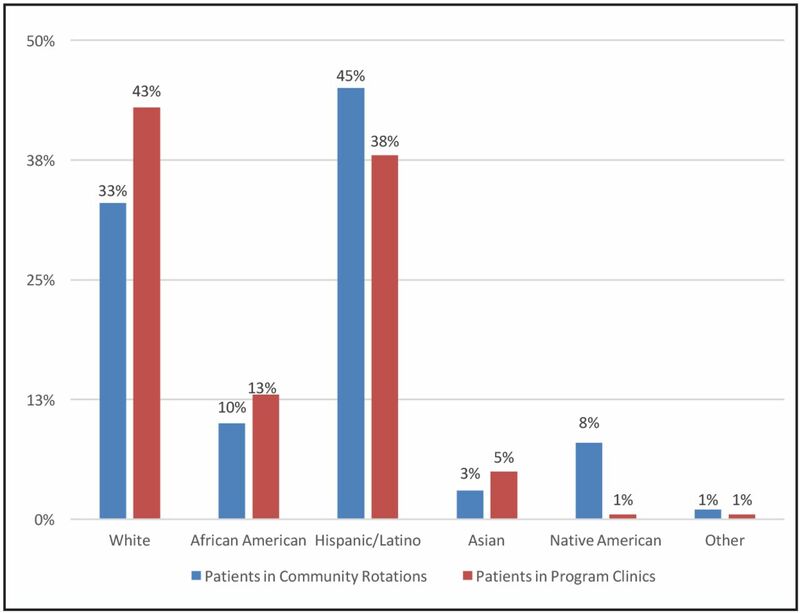 The racial/ethnic percentages of the patient populations for the community rotations and program clinics, as estimated by program directors, are shown in Figure 2. The largest population in the community rotations was Hispanic/Latino (45%), while the largest population in the program clinics was white/Caucasian (43%). The types and characteristics of the community rotations in which the students participated are shown in Table I. The dental hygiene programs participated in eleven different types of rotations. At least four or more of the programs participated in a combination of rotations including jails, hospitals, schools, public clinics, and nursing homes. A variety of other clinical rotations were only used by a single dental hygiene program and included a religious affiliated clinic, state school, VA dental clinic, Head Start, health fair, and Air Force dental clinic. Overall time spent in community rotations ranged from 0 to 108 hours, depending on the program. Each program participated in anywhere from 0 to 5 community rotations. At least half of the programs spent time in schools and nursing homes, but the highest average number of hours was spent in public clinics. Table II displays the types of CC training programs in which the students participated and the amount of time spent in each. All but one program offered some type of CC training. Dental hygiene programs offering CC training either provided lectures, a course, and/or a specific training program to train their students in CC. Descriptive statistics for the CCCQM scale scores as well as the range of possible scores are shown in Table III. With the exception of overall CC, none of these variables were normally distributed. Therefore, they are summarized here using medians and interquartile range (IQR). In the interest of completeness, means and standard deviation are also displayed. The median overall CC score was 88 and scores ranged from 52-115. Students scored between the 60th and 65th percentile for knowledge, skill, and comfort. Students scored highest in attitude, at the 86th percentile. The amount of time spent, the number and the type of rotations all significantly affected CC scores. In terms of time spent, there was a small but highly significant association between the hours spent in community rotations and knowledge (tau=0.154, p=0.001) and overall CC scores (tau=0.124; p=0.009). The amount of time was then divided into two categories, 0 to 50 hours and over 50 hours. Students spending over 50 hours in community rotations scored significantly higher in knowledge (median scores 18 vs. 17; p=0.001) and overall CC (median scores 89 vs. 85; p=0.006) than the students with ≤ 50 hours in community rotations. Differences were identified among the groups of students in CC performance with regard to the number of community rotations. Students were divided into six groups according to the number of rotations (0-5), yielding the following overall significant differences among the groups: knowledge (p<0.001), skill (p<0.001), comfort (p=0.004), attitude (p=0.002), and overall CC (p<0.001). Post-hoc tests revealed that students with four rotations consistently out-performed students with fewer rotations across all scales (p ≤ 0.002) with three exceptions; four rotations outperformed five rotations in the skill, comfort and overall CC scales (p < 0.001). Certain types of community rotations resulted in better CC performance. Clinical rotations in which only one program participated were grouped into the “other” rotation category (see Table I). Students who participated in public clinic rotations scored significantly higher than non-participants with regard to comfort (p=0.049), attitude (p=0.007), and overall CC (p=0.040). Those participating in school rotations scored significantly higher in knowledge than non-participants (p=0.044). Students with the “other” rotation exper-ience scored significantly higher in knowledge than non-participants (p<0.001), skill (p=0.001), attitude (p=0.003), and overall CC (p<0.001). Some community rotation experiences were negatively associated with CC performance; students with hospital and nursing home experience scored lower than those without experience in those rotations. Those with nursing home experience scored lower in knowledge (p=0.009), skill (p=0.001), comfort (p<0.001), attitude (p=0.001), and overall CC (p<0.001). Those with experience in hospital rotations scored lower in skill (p=0.020) and overall CC (p=0.026). For analysis purposes, the extent of diversity of patients in program clinics and community rotations were categorized as: least, somewhat, or most diverse. The patient pools were considered least diverse if at least 60% belonged to a single race/ethnicity. Those in which at least one race/ethnicity made up 50-59% of the pool were designated “somewhat diverse.” Those in which at least two of the race/ethnicities did not exceed 50% were designated as “most diverse.” No significant relationships were found between the extent of diversity of patients seen in community rotations and CC scores. However, small but significant associations were found between the diversity of patients seen in program clinics and skill (tau=0.189, p=0.001), overall CC (tau=0.181, p=0.001), and attitude (tau=0.114, p=0.042). Significant differences in performance were identified among students seeing varying levels of diversity in their program clinic patient pools: overall CC (p<0.001), skill (p<0.001), knowledge (p=0.010), comfort (p=0.023), and attitude (p=0.005). Post-hoc tests revealed that students who saw the most diverse patient population scored higher in overall CC, skill, comfort, and attitude than those students seeing least and somewhat diverse patient pools (p ≤ 0.014). For knowledge, there was only a difference in scores between those seeing a most and somewhat diverse patient population in program clinics. CC training hours ranged from 0-11 hours. To test for differences, training hours were divided into three groups: 0-5 hours, 6-10 hours, and over 10 hours. Small but significant associations were found between the number of CC training hours students received and overall CC (tau=0.113, p=0.032), attitude (tau=0.112, p=0.036), and knowledge (tau=0.107, p=0.044). Students with 6-10 hours of CC training scored significantly higher than students with 0-5 hours of CC training in every category (p≤0.002) except for comfort (p>0.05). One anomaly was students with 6-10 hours of CC training scored significantly higher than students with over 10 hours of training in overall CC (p=0.013) and skill (p=0.008). Statistical analysis of student race/ethnicity was performed based on the collapsed categories (Figure 1b). Students of “other” race/ethnicity scored significantly higher than whites in overall CC and knowledge (p=0.020) (Table IV). Hispanics scored significantly higher than whites in skill and overall CC (p≤ 0.005). Of the 239 students, 153 students provided 208 comments on at least one of the two open-ended questions regarding their significant educational experiences in program clinics, community rotations, or CC training. The five themes represented in the data were cultural learning experiences (n=73), language barriers (n=42), hands-on learning of CC (n=40), CC training (n=36) and the need to be culturally competent (n=17). One student described the importance of hands-on, diverse patient experiences with, “I feel that they do a great job teaching us about cultural competency and sensitivity, but there's nothing like actually having a patient with different beliefs to teach you how to interact and plan their treatment.” Another student stated, “I learned to work with all different types of patients in rotations.” One student reiterated the importance of this study, “Every dental hygienist should know how to communicate and understand every other culture out there especially in the United States, because it is a multi-cultural country.” Table V highlights specific comments made by respondents related to the five themes. This study found that the self-assessment of CC by dental hygiene students in Texas was significantly enhanced by participation in community rotations. These findings parallel previous studies showing increased CC with service-learning and community rotation experiences.6,11-13 Student self-assessment of CC was also influenced by having CC training and a diverse patient pool in the program clinics. Racial/ethnic diversity within their own class also contributed to their CC. These results also parallel previous findings that the race/ethnicity of students, patients, and faculty should be considered when implementing any type of CC training, whether it be a community rotation or a training module.9,14,15,27, 28 These results have significant implications for dental hygiene curricula and the design of patient care experiences. This study found CC scores were higher with community experiences and were linked to the time spent, the number of rotations and the type of community experiences. Students participating in more rotations generally scored higher than those participating in fewer rotations. Furthermore, participation in public clinics, schools, and “other” rotations resulted in higher CC scores. One of the themes of the open-ended responses was that while training helped, it was the actual patient interactions that substantively strengthened the students' CC. Based on these findings, dental hygiene programs should evaluate the amount of time their students are spending in community rotations and the diversity of those experiences when reflecting on ways to improve the CC of their students. There are two possible explanations for why skill, comfort, and overall CC were lower for programs with five rotations versus four rotations. The single program participating in four rotations spent the most time in community rotations, totaling 108 hours, thus increasing the overall patient exposure time. Also, the two programs participating in five rotations had the least amount of CC training, 0-5 hours, which could have influenced the students' skill and comfort level. Two specific types of community rotation experiences resulted in lower CCs scores; hospitals and nursing homes. It is possible that factors unique to these types of experiences negatively impacted the development of CC. Other explanations for these results could be that the four programs with hospital rotations also had the least CC training (0-5 hours). Also, although six programs participated in nursing homes, this rotation was one of the shortest, totaling just five hours. Dental hygiene programs should look at these types of sites carefully to evaluate the quality of those experiences and try to identify factors that might negatively influence the student experience. Students scored highest (86th percentile) in their attitude towards CC. This is certainly a good foundation for producing culturally competent dental hygienists. However, these results also indicate a need for enhancing CC in the areas of knowledge, skill, and comfort where students scored between the 60th and 65th percentile. Training has been shown to improve CC knowledge, self-awareness and attitudes.6-10 This study supports the importance of training as students demonstrated increased scores for every CC scale except comfort. The one anomaly, 6 to 10 training hours resulting in higher scores than >10 hours, could be explained by the fact that the two programs (29 students) with > 10 training hours had little actual experience, spending < 50 hours in community rotations. The results of this study do not afford any evidence that > 10 hours of training improves CC or any of its components. Regarding the fact that training did not improve “comfort,” student comfort with diverse patients might be more related to actual experience than training; in this study, comfort scores were improved with an increasing number of rotations. Significant relationships were noted between the diversity of patients in the program clinics and every CC scale. In contrast, the diversity of patients seen in community rotations did not have a significant impact on CC. The fact that students generally spend much more time in their program clinics than in community rotations may explain these contrasting findings. Although it is a difficult variable to control, dental hygiene programs should make sure their students are seeing the most diverse patient pool possible. There were differences among the student racial/ethnic groups with regard to CC scores. Although the majority of the sample (65%) was white, Hispanics significantly outperformed them in skill and overall CC. The smallest category of “other” (African and Native American & other non-whites) scored higher than whites in knowledge and overall CC. The majority group can often be unaware of the minority perspective and experiences. Perhaps this means that white students need more community rotation experience and training when it comes to CC. These findings support the idea that student race/ethnicity is a factor for consideration when designing a CC curriculum. Although faculty diversity was not a variable in this study, Connolly et al. identified the lack of minority faculty members as another barrier to CC.15 This should be considered as well as the race/ethnicity of the students and patients. The CCCQM is a self-assessment instrument, therefore it is not a standard measure of knowledge or other aspects of CC performance. Another limitation, as reported by the program directors, was the diversity of patients seen in the program clinics was easier to track than the diversity of the patients in community rotations. Finally, selection bias cannot be ruled out; program directors who opted out (14 of 26) may have been those least comfortable with their community rotations. Dental hygiene programs not participating in community rotations should consider developing rotations to improve students' cultural experience and better prepare them for current societal needs. Programs already participating in community rotations should use an assessment tool similar to the CCQM to evaluate the impact of their community rotation program on students' CC.18-19 If scores are found unsatisfactory, dental hygiene programs should analyze the time spent, number and type of community rotations as well as the diversity of students, patients, and faculty in addition to the quality of CC training. This study is the first to evaluate the impact of community rotation experiences on dental hygiene students in the state of Texas. Results from nearly half of the Texas dental hygiene programs demonstrated an unambiguous link between the extent of community rotation experiences and self-assessment of CC. This study also found that the amount of time spent in community rotations, number of community rotations, types of community rotations, diversity of patient pools, diversity of students, and CC training were associated with increased CC scores. Based on these findings, it is recommended that dental hygiene programs have their students receive training, spend more time in a variety of community rotations and treat diverse patients to assure they graduate with the CC necessary to treat diverse patient populations. Funding for this research came from the Texas A & M College of Dentistry, Dallas, TX. Rita A. Classe-Cutrone, RDH, MS is a former clinical assistant professor, Caruth School of Dental Hygiene; Ann L. McCann, RDH, PhD is a professor and director of planning and assessment; Patricia R. Campbell, RDH, MS is a professor and executive director of the Caruth School of Dental Hygiene; Janice P. DeWald, BSDH, DDS, MS, professor emerita and former director of the Caruth School of Dental Hygiene; Emet D. Schneiderman, PhD, is a professor in biomedical sciences, all at the Texas A&M University College of Dentistry, Dallas, TX.
. Increasing cultural competence in the dental hygiene profession. Can J Dent Hyg. 2009 Nov-Dec;43(6):297-305.
. Cultural competence and health care disparities: key perspectives and trends. Health Aff. 2005 Mar-Apr;24(2):499-505.
. Accreditation Standards for Dental Hygiene Education Programs. [Internet]. Chicago(IL): Commission on Dental Accreditation; 2013 Jan 1. [updated 2017 Feb; cited 2015 Jan]. Available from: http://www.ada.org/~/media/CODA/Files/dh.pdf?la=en. (Ed.). Service-learning in higher education. San Francisco: Jossey-Bass; 1996.
. The impact of service-learning on students' cultural competence. Teach Learn Nurs. 2012 Apr;7(2):67-73.
. Comparing methods of cultural competency training and assessment in a predoctoral dental course. J Dent Educ. 2012 Apr;77(4):476-483.
. Development and assessment of a cultural competency curriculum. J Dent Educ. 2008 Sep;72(9):1020-1026.
. Dental students' attitudes toward treating diverse patients: Effects of a cross-cultural patient-instructor program. J Dent Educ. 2008 Oct;72(10):1128-1133.
. The cultural climate of southwest dental colleges: Dentistry and dental hygiene. J Dent Hyg. 2015 Feb;89(1):34-45.
. Dental students' perceptions of self-efficacy and cultural competence with school-based programs. J Dent Educ. 2012 Sep;76(9):1175-1182.
. The impact of service-learning on cultural competence. Nurs Educ Perspect. 2010 Jan-Feb;31(1):18-22.
. Utilizing public health clinics for service-learning rotations in dental hygiene: A four-year retrospective study. J Dent Educ. 2009 Mar 1;73(3):358-374.
. Assessing the cultural competency of dental students and residents. J Dent Educ. 2008 Oct;72(10):1122-1126.
. The cultural adaptability of health sciences faculty. J Dent Hyg. 2000 Spring;74(2):102-109.
. Reliability and validity of three measures of multicultural competency. J Couns Dev. 2001 Fall;79(4):486-496.
. Cross-cultural adaptability inventory manual. Minneapolis, MN: NCS Pearson-Inc.;1995.
. Use of the cross-cultural adaptability inventory to measure cultural competence in a dental hygiene program. J Dent Hyg. 2009 Summer;83(3):106-110.
. The role of education in the development of cultural competency in dental hygiene students. J Dent Hyg. 2007 Winter;81(1):31.
. Cross-cultural adaptability of Texas dental hygienists and dental hygiene students: A preliminary study. J Dent Educ. 2009 May 1;73(5):563-569.
. The knowledge, efficacy, and practices instrument for oral health providers: A validity study with dental students. J Dent Educ. 2013 Aug 1;77(8):998-1005.
. Online cultural competency education for millennial dental students. J Dent Educ. 2014;78(6):867-875.
. Critical Synthesis Package: Clinical Cultural Competency Questionnaire (CCCQ). [Internet]. MedEdPORTAL Publications; 2013 Apr 12;9:9390. [cited 2014 Dec]. Available from: http://dx.doi.org/10.15766/mep_2374-8265.9390.
. Measuring physicians' and medical students' attitudes toward caring for immigrant patients. Eval Health Prof. 2010 Dec;33(4):452-472.
. Nine constructs of cultural competence for curriculum development. Am J Pharm Educ. 2010 Dec;74(10):1-11.
. Clinical cultural competency questionnaire (CCCQ). [Internet]. New Brunswick (NJ): Center for Healthy Families and Cultural Diversity, Department of Family Medicine, UMDNJ-Robert Wood Johnson Medical School. 2001. [cited 2014 Oct]. Available from: www.umdnj.edu/fmedweb/chfcd/aetna_foundation.htm.
. Effect of school environment on dental students' perceptions of cultural competency curricula and preparedness to care for diverse populations. J Dent Educ. 2007 Jun;71(6):810-817.
. Teaching culturally sensitive care to dental students: A multidisciplinary approach. J Dent Educ. 2014 Mar;78(3):454-463.